Did you ever ask yourself what Scottrade offers in detail and if this brokerage account may be the one that could provide you with what you are searching for? In this review I will give you the most important basic information to help you to decide if it may be worth it to have a closer look at Scottrade's website. By now, Scottrade is in the business for more than 35 years. This seems to be a first advantage as this means that Scottrade looks back at many years of experience. They introduce themselves as the ones who help every client to reach his personal financial goals with an individual solution for every single trader. The service includes all important tools for self-directed investors and portfolio management for those who prefer to trade this way. Scottrade promises that their professional investment consultants will review your personal strategy to see where you are right now to be able to take you to where you want to go. With their stock﻿﻿﻿﻿ screener tools for mutual funds, equities and ETFs they want to enable you to maintain your portfolio in the best possible way to be more successful with well informed, better trade ideas. They present the founder and CEO of Scottrade, Rodger Riney, as the one who feels responsible for taking the right steps to find a more profitable way of investments for each and every user. Update: Scottrade is now TD Ameritrade. Continue reading the TD Ameritrade review or go ahead with this review. Well, all this sounds good and promising. But don't you see promises like these on every platform in the market? Does Scottrade truly make a difference? In any case, they seem to believe in themselves as they refund up to $ 100 in broker transfer fees if you decide to open a new account with Scottrade. Will it be worth it to give that a try? I will surely do my best to answer this question. So, please, continue reading. 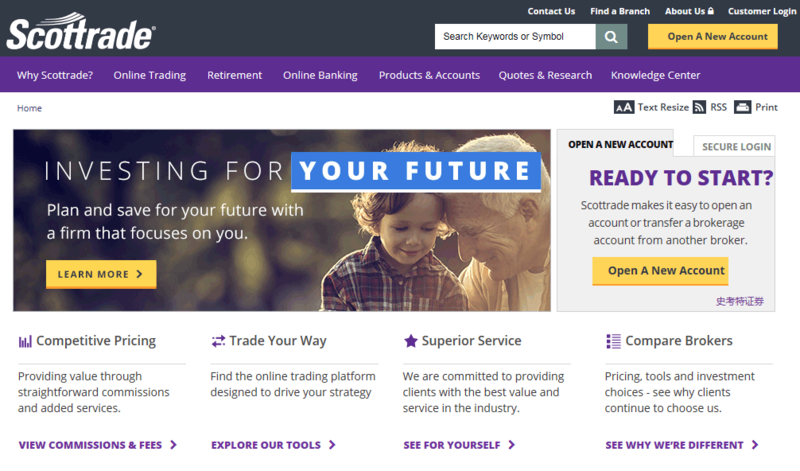 What do you have to know about Scottrade and how does the platform look like? My very first impression of a new platform is always important to me. When I opened this one, in some way I was overwhelmed by all the detailed information. Maybe all these details mean an advantage, but I think, it is a little too much for a first overview when you are simply looking for some basic data. Beside this, in my opinion, the navigation on this platform is a little confusing as there are too many “hidden points” you only discovering when you open a new page. This doesn't make it all easy to share the most important facts with you. But maybe some of you will enjoy the hunt for more and more details that this platform offers. In any case, more than 35 years in the business have to be connected with experience. Rodger Riney founded the company in Scottsdale in Arizona in 1980. Back then it was originally called Scottsdale Securities. All through the years since then, Scottrade provided investors of all levels with a big choice of investment products including tools, research and education for the best possible strategies to reach their goals. And the company goes on growing. What Scottrade wants to gain is the users' confidence and they promise to be there for their clients whenever they need help and advice. For the promised one-to-one support, you can reach them via online chat and e-mail, on the phone, with the help of the Scottrade mobile app and even at their 495 local branches all over the United States. On the platform you will find updated news releases about Scottrade to learn more about the impression they are making. They also like to present themselves as the brokers who are much more than just $ 6.95 trades for their clients. So, what does this mean in detail? 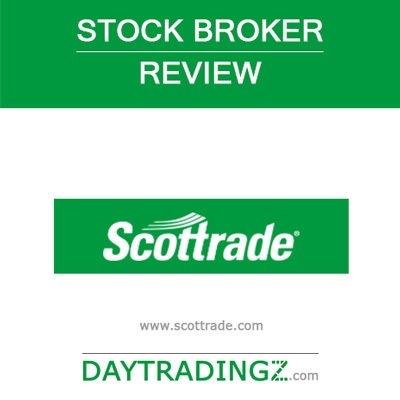 In the next section of this review we will go into detail to find out if Scottrade is truly making a difference. When I start going into details, I always like to start with something positive. Here it comes. Scottrade is not charging any account maintenance fees or inactivity fees. I think, these are really good news that inspire us to go further. But better be careful when you want to use these free services as Scottrade adds the information that processing fees assessed by third parties may be charged for some of the services and products that require additional fees or transaction minimums. In these cases, the users are responsible for informing themselves if any additional fees may apply. So, what is Scottrade offering in detail? As soon as you open and fund your account with Scottrade, you will have access to the client website that is available in English and in Chinese. Scottsdale promises highly advanced state-of-the-art trading tools that are user friendly and easy to handle while they describe the navigation as being intuitive and fast. All around the clock you can watch your account including the balances, your watch-lists and alerts and your pending orders. At the same time you will be able to do all kinds of investment research you need for better decisions and you will see constantly updated analyst reports, market news and commentaries to spot the right trends and to use them to your advantage. Scottrade promises to help you to save time as they make technical analysis easy to read and easy to understand. Drag & Drop Convenience to customize your trading site. With this you are able to create up to three trading websites with up to 23 different tables being displayed on every page. You will be able to select, to grab and to place the data according to your personal choice and preferences. Customizable Positions and a Quick Trade Bar to add even more power. Adjust the positions page of your account to your individual style of trading to be perfectly prepared. The Quick Trade Bar will enable you to watch and to place your orders fast and easily while you are browsing online. Quick Quotes and Morningstar Data Put Research at Your Command. With the help of trading tools, tables and stock performance charts – many of them with real-time market information – you can research and review stock quotes and more kinds of information. By using this, you will find the trading opportunities that fit with your personal trading strategy. Powerful Tools for Portfolio Management. The professional portfolio review tool that Scottrade offers is powered by Morningstar. This one assists you when you are searching for the investments that fit with your portfolio. The preset asset allocation models will help you to compare current with targeted investments to select the most promising opportunities. Market Snapshots and Comparisons Provide Timely Information. Watch the trading performance and volume by using the market pulse charts. The user friendly stock, mutual fund and ETF screeners will show you the top performers while you will be able to see, to compare and to select all kinds of useful market data to complete your market research. Convenient Investing Tools to enable a Birds-Eye View of the Market. Benefit from a detailed overview of the trading market that includes valuable insights that will help you to see the big picture to find profitable opportunities for your investments. Regarding the costs, Scottrade promises completely transparent trading fees and commissions without any hidden charges. In addition to this, on the platform you will find a detailed list of additional fees, like e.g. for mail confirmation, overnight delivery etc. So, everything seems to be clear and you are able to see all costs before placing your trade. Day trading for beginners with Scottrade? When we are talking about the service, nowadays it is always an important question if you can use all services with your mobile devices. Yes, Scottrade promises you full access with your mobile devices and the Scottrade Mobile app has just been redesigned. All the same how clear and transparent a service may ever be, it is always important to know how and when you can reach the customer service for further questions or when you will need help. Well, as I told you before, you can reach the customer service on the phone, via online chat and e-mail, with the help of the Scottrade mobile app and by contacting the local teams for personalized support. The Scottrade customer service will be ready to answer your questions from 6 a.m. to 1 a.m. ET from Monday to Friday and from 9 a.m. to 7 p.m. on Saturday and on Sunday. This is quite impressing as you will still find more awards. Last, but not least, I want to mention the positive fact that Scottrade is a member of the SIPC (The Securities Investor Protection Corporation), a non-profit organization that was founded in 1970. This protects the investors in the case if their brokerage firm fails or declares bankruptcy. There is a link with all further details that you can find on the platform. I guess, this will surely make you feel safer. I really like it that Scottrade seems to be focused on a personalized service to find the perfect solution for your all individual needs. Also the lists of tools and services are impressing, just like the big number of awards. In any case, the safety that the membership in the SIPC gives the users is another advantage – just like more than 35 years of experience in the business. The costs seem to be transparent and Scottrade promises that there are no hidden, additional charges. All this sounds fair for sure. And I also like the free services and the free online resources for education. However, they present the platform as being especially user friendly and easy to handle and I have to admit that I have a little problem with this. All right, I was not trading on this platform. So, I am still ready to believe that this may be true once you start executing your trades. But when I just wanted to find the basic information for this review, I thought that the website was too much overloaded with information, especially since many statements were repeated again and again – just in different words and at various spots of the platform. This doesn't fit with my imagination of saving time. Well, this is only my personal point of view. Let's hope that you will be impressed when you will give this platform a real try with trading.